Handbook for Dragon Slayers by Merrie Haskell. Harper, 2013. Currently Available. Face Value: Classic fantasy look. What I love about this is that it looks just like the story inside it. All the essential elements (Tilda, her horse, the dragon), are present, and the general aesthetic suggests a traditional fantasy with a contemporary feel – exactly what this is. Who would we give it to? Did you love Patricia Wrede’s Dealing with Dragons books? Let me tell you about Merrie Haskell, the best fantasy writer for middle grade audiences I’ve come across in years. 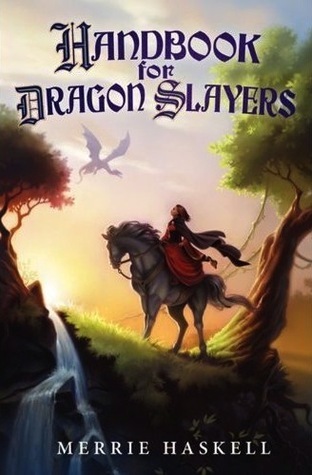 If you didn’t read her terrific first novel, The Princess Curse, you should check that one out too, but Handbook for Dragon Slayers is even better. Review: Tilda often wishes she could be free of a princess’s responsibilities. But when a greedy cousin steals her land and tries to kidnap her, everything changes. Rescued by her handmaiden Judith and friend (and dragon-slayer hopeful) Parz, Tilda is caught up in their quest to slay a dragon. But things don’t go as planned – neither dragons nor humans turn out to be what was expected. Blending familiar stories and legends (The Wild Hunt, Bluebeard), with a totally original character and narrative, the ultimate adventure here is outstanding. Tilda is a great hero – smart and resourceful and ultimately incredibly brave. What I love is that she’s actually terrified of a lot of things – and ends up finding a way to get past her fears and do the brave, right thing. It’s not a cut-and-dry hero’s adventure – instead she has to reconcile what she wants with what people expected her, and what her circumstances require of her. Also, Tilda’s clubfoot, is a major part of both her journey and the story. Haskell does a great job of creating a protagonist with a disability that is an essential part of the story without defining her completely. Her disability has informed so much of her experiences – physically in terms of what she can and cannot do easily and emotionally, in terms of what people expect of her and how she is treated. Tilda defies these expectations, which is awesome, and there is no magical resolution to fix her foot. And ultimately this is not a book about disability as much as it is a book with a main character who has a disability. That distinction is important, and it brings the book to a whole new level. Plus as much as I loved Tilda, my favorite character in the book was actually Judith, Tilda’s handmaiden and an aspiring dragon-slayer. Judith yearns for adventures of her own, but is deeply loyal to both Tilda and her kingdom. She has an incredibly high moral standard, and isn’t afraid to stand up to Tilda, even if she is a princess and technically her employer. The two of them really are friends, and Haskell actually engages with the complicated truths that emerge from a friendship that also has distinct class and power dynamics involved. With her second middle grade fantasy, Merrie Haskell has proven again how capable she is of creating new stories out of familiar ones, that enhance the source material and create whole new stories and worlds. Her books are feminist and complicated, engaging with the multifaceted social dynamics of gender, class and more that fairy tales are entrenched in. With this book she has become permanently embedded in the Slatebreaking-Must-Read list. This entry was posted in Middle Grade, Reviews and tagged dragons, Fantasy, Middle Grade, princess, Retelling. Bookmark the permalink. Sounds like a fun and interesting book! I wanted to read this one before, but now I MUST read it! thanks.